This is an Approved Little League #81 double header baseball made by J. DeBeer & Son of Albany, NY. I do not know too much about these but I believe they are from the 1950s. 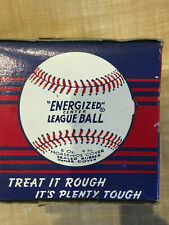 VINTAGE J.DEBEER AND SON BASEBALL IN ORIGINAL BOX "ENERGIZED" CENTER LEAGUE BALL. Never been opened Shipped with USPS Priority Mail. J. deBEER and SON Baseball in Unopened Box Albany, NY est 1889 Shipped with USPS First Class Package. Unopened box. Baseball is wrapped in paper. The picture of the baseball is from a box i have that's been opened. ONE IS A CAMBRIDGE OFFICIAL NATIONAL LEAGUE HORSEHIDE COVER NO. 125. THE NEXT ONE IS A j deBEER AND SON DOUBLE HEADER OFFICIAL LITTLE LEAGUE NO. 91, 5 OZ. WITH A CORK CENTER. THE LAST IS A j deBEER AND SON SPECIAL LEAGUE NO. 61, 9 IN HORSEHIDE COVER. Autographs include Masanori Murakami (The 1st Japanese player to ever play in the Major Leagues). Robin Yount. Tim Wallach. Roy Howell. 1966 - 1973 Little League Baseball. Awesome display piece for the mancave. This is a 1950s J DeBeer and son little league baseball with original box. Thw box is opened and has some damage as seen in pictures. Ball is near mint with minor markings. Ask if more pictures are needed. VINTAGE J. deBEER & SON OFFICIAL SOFTBALL No. N120 NEW IN ORIGINAL BOX. NICE SCARCE ORIGINAL COLLECTIBLE PIECE FROM A LOCAL ESTATE NON SMOKING HOME. "Official Little League Senior" Baseball. Ball is New/unused. 95-SL, Leather cover, Cushioned Cork Center. Vintage--J. deBEER and SON- No.120-- Box-- Albany, NY est 1889-with --a-ball? Box is fair shape for its age----.